Dear Mona, My 4-year-old broke her leg. I’d like to tell her how many other kids break their legs, but I wasn’t able to find any answer. Can you help me reassure her with how many other kids break their legs or arms? I’m sorry to hear about your daughter. Being a kid really isn’t the relentless fun that many adults nostalgically remember. I want to offer her solace, but I’m also aware that she probably won’t understand the charts below — so this article might serve to alleviate your concerns more than hers. You can tell her about my cousin Noor who, at the age of 4, was told that she should “stop being such a scaredy-cat and get on the bloody trampoline.” Five minutes later, Noor was grasping an S-shaped arm and fixing two wet eyes on her older cousin who issued the reckless advice. Broken bones happen, trust me. And they happen often. In the U.S. (sorry Drew, the tyranny of the American reader majority wins here), the Centers for Disease Control and Prevention (CDC) gathers data on who winds up in the emergency room and why. The CDC’s National Hospital Ambulatory Medical Care Survey collected data from 357 emergency departments. In 2010, the year of its most recent survey, the CDC estimated that there were between 3.5 and 4.4 million emergency department visits for which the first-listed diagnosis was fracture. Whether it was a complete or partial fracture, that diagnosis still translates to “you’ve got a broken bone.” To give you a bit of perspective on those numbers, fractures made up about 2.8 to 3.2 percent of all emergency department visits in 2010. (We’re talking everyone here; we’ll get to kids in a moment). A human skeleton with major bones noted. You specifically mentioned that your daughter broke her leg. 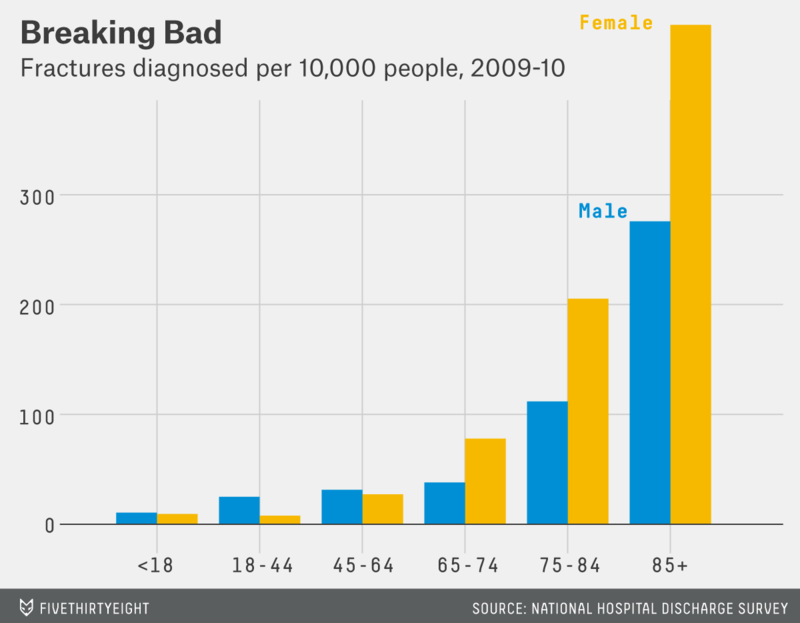 Luckily, the National Hospital Discharge Survey keeps track of diagnoses by assigning a code to each type of injury. For example, if the diagnosis is recorded as “800,” it means a fracture of the skull (in fact, the data is far more detailed than that — 800.02 indicates one specific type of fracture to one specific part of the skull during which the patient was unconscious for less than an hour — but for now, let’s just use those big categories). 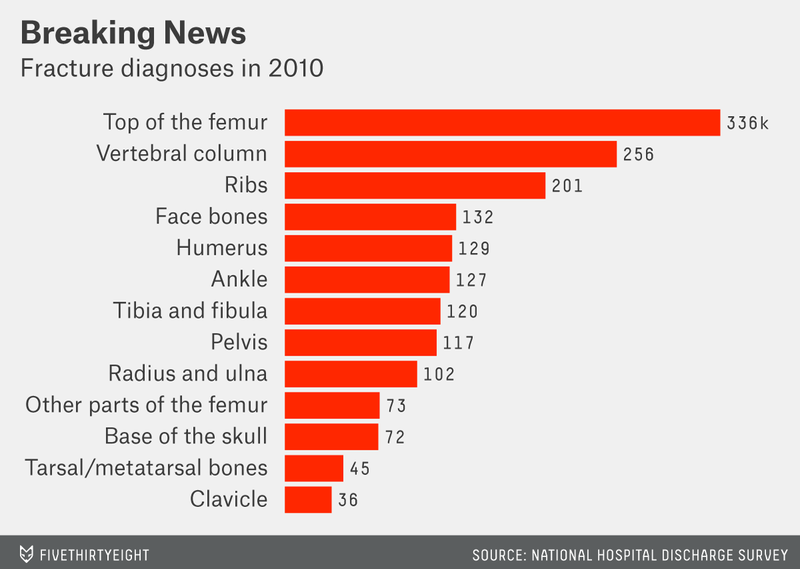 A broken leg was more than twice as common as a broken arm in 2010. There were approximately 529,000 fractures to the femur, tibia and fibula compared with 231,000 fractures of the humerus, radius and ulna. But you asked specifically how many other kids were breaking bones. Does the fact that your daughter has only been on this Earth for four years makes her more accident-prone? That discharge survey also registered the age of those outpatients and calculated that in 2009-10, children were actually the least likely age group to go to hospital with a first-listed diagnosis of fracture. For every 10,000 children, there were just 10.2 discharges with a diagnosis of fracture compared to 18.1 for every 10,000 Americans 18 to 44 years old. Assuming that both sexes are just as likely to go to the emergency room, men are more at risk of broken bones before age 65, after which women become far more at risk. That’s partly because older women are more likely to have osteoporosis, a disease that makes bones weak. If none of these numbers comfort her, tell her that my cousin Noor made a full recovery; the only remnants of her injury being a phobia of trampolines and an ability to resist stupid family goading.